Deb's Cup of Tea: Ordinarily, I wouldn't touch this. It's not the best photo in the world because of the lighting. I didn't want to use a flash to attract attention to the fact that I was photographing my gelato at the coffee shop tonight. This is mint chocolate chip gelato. So? I usually decline mint chocolate anything. I think it's an awful thing to do to chocolate, combine it with mint. I'm not a fan of mint. But Melody bought me dessert while we were listening to her hubby play guitar and unless you know you're going to have a physical reaction to food, it's really impolite to decline. You eat a little and then say, "Oh gosh. I didn't realize I was so full." Manners. My momma taught me. This was good, very good, surprisingly good. It was green, something you can't see here, with little flecks of chocolate chips in it. 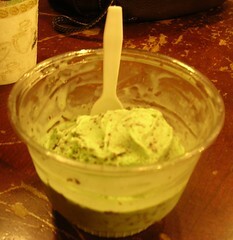 The mint was not overpowering and there was no metallic aftertaste as can happen when you combine mint and chocolate. No one was more surprised at how smooth and luscious this was than me. I will still view mint and chocolate combinations with a very skeptical eye, but I might be less likely to turn up my nose at them now.